When you work weekends, Monday is a day to look after routine chores and errands. Drop kids at school, pay some bills, make travel arrangements for friends and family, pick up long johns, clean the helmets and do the laundry. The Argos this week might need some spray and wash. The paint from those fabulous logos on the field leaves a stain. And the back of number 15 had way more grass stains than is comfortable for fans of the league’s oldest superstar. The locker room staff have a big job making sure the uniforms are clean because that’s any fan’s first impression of a team. What do they look like? What colours are they? What shirt/sock/pants/helmet combination are they wearing? Why does laundry matter? Jerry Seinfeld’s opening monologue sums it up pretty good. But laundry only matters at first glance. I wasn’t always an Argos fan, I grew up outside Edmonton and lived and breathed green and gold in my formative years -their glory days. While the Grey Cups were great, what really mattered was that you beat the Calgary team in the Labour Day weekend series before you inevitably met them in the playoffs. In 2012 I decided I would volunteer with the 100th Grey Cup Festival leading up to the game. I helped with the alumni table with retired greats making sure they were comfortable and introducing them to fans as they approached. One of the most enjoyable parts of my evening was spending time with Stampeder legend Herm Harrison. He was engaging and charming and patient with fans, even those too young to have any idea who he was. His legs were bad, his hands were nearly too crippled to hold a pen, and he died less than a year later. But he handled himself with grace and he was the first athlete from Calgary that I knew personally and he made an impact on me. I was fortunate enough to get a last-minute ticket to the game on Sunday and went in to the game with one thing in mind; boo the Stampeders mercilessly. I was thrilled when the crowd at Skydome drowned out the first of Calgary’s plays at the line of scrimmage. I found myself cheering when Michael ‘Pinball’ Clemons was introduced; I’d shook his hand briefly after he gave a pep talk to the assembled crowd of guests and volunteers the night before. Through the course of the game I found myself cheering for the Argos simply for having met Pinball. One man had changed my perspective to see the people behind the laundry. I was cheering for Ricky Ray, newly acquired from the Eskimos. I was cheering for larger than life personas of Foley and Belli. Chad Kackert seemed like a guy who’d sit beside you on the bus. Chad Owens seemed like the world’s favourite underdog. It was the people in blue that I was cheering for, not the villains in red I was cheering against. Since 2012 I’ve attended a lot of games, we’ve been season ticket holders the last two seasons. We’ve made friends in the stands and even with the staff in our sections. You start seeing the stories that make personal attachments. The team’s success comes with a vested interest. You need them to win because you start to care for them as people. We met Chris Van Zeyl’s mom before a game last year. She was so proud of him. On Sunday, he said he was near tears as he approached the line of scrimmage for the game-winning touchdown and was sobbing in joy after the play. We saw pictures of long-time Argo Matt Black with his family after the game. Released mid-season and now returning to the Grey cup. We read how calm and quiet superstar Ricky Ray takes the train on game day so his wife can drive the kids down in the car for the game. That game-winning drive was just another commute for number fifteen, this time going to Ottawa. But this one was so good he smiled. We’ve learned to love James Wilder Jr. The player who looks like he was drawn by Marvel has captured our hearts with his drive, his passion, and his personality. We get to share in the joy he has playing in front of his family and friends. Lemon, Lang, Butler, Ball. Gabriel. All hurt this season. All emotional leaders. All part of the late season surge. Coach Trestman. The quiet man who seems to bring the best out in his players. Chad Owens on the other team. A fan favourite that the crowd wanted to see, but not succeed. There was a big crowd for this game. Many of them came for the laundry. Let’s hope they learn to love and respect the men wearing it. It feels so much better when they win. See you at the Grey Cup. I’ll be cheering against the red laundry, and for the men in double blue. Interesting, enriching take on things. 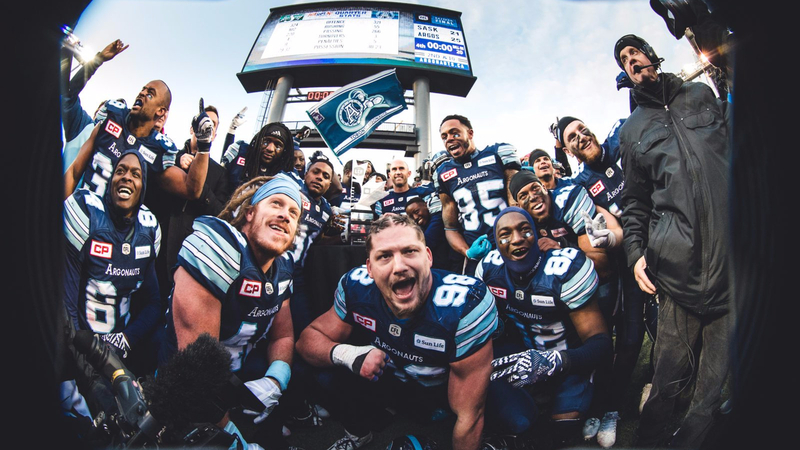 Personal attachments – the human element – clearly a significant aspect of CFL loyalty. Yes, some parallels with the 2012 squad – should be a great cultural gathering (oh yes, including the game). May the boys in (double) blue come through!